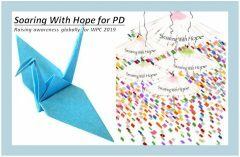 Because it is World Parkinson’s Day…. There are many things I want to share with you. Yesterday, the first #ParkinsonsEve took place in Great Britain. I wish I could have attended, but going to Kyoto is a priority this year. However, those of us who stayed home will have an opportunity to watch at least some of the conference in the next few days. Stay tuned for the info on where you can watch it online. For more info go to parkinsonseve on Facebook. This month, the Parkinson’s Foundation wants to know your 🔑 to living well with PD. Whether you are living with PD, are a caregiver or a healthcare professional, tell us your tip. From managing freezing to sleeping and bathroom tips — no topic is off limits. Our hope is that others can replicate your tips and make their life just a little easier. Click here: #KeyToPD to share yours. My #KeyToPD: Finding new friends with PD who understand how you feel. Are you familiar with the website The Mighty? I was not until contacted earlier this week by them to contribute a few quotes for 12 Things You Don’t Understand About Parkinson’s Unless You Have It, which was published today. The Mighty, according to their website, is a digital health community created to empower and connect people facing health challenges and disabilities. There is a Parkinson’s community on the website that you can subscribe to, and you can also share your stories, ask questions and connect with other Parkies. And finally, there were problems with the survey that I sent out a few weeks ago asking how YOU are living well with Parkinson’s Disease. I want to thank the 139 people who completed the survey, but unfortunately, I will not be able to use the data. I am going back to the questions as originally posted on Facebook. Positive: Exercise, Advocating for myself with my doctors, Friendships with other women with PD. Click here to take the survey. Any answers sent by email will not be included in the final report. Please respond by April 22. Thank you in advance for helping out. Clinical Trials for Parkinson’s Need You!